Graduate Management Admission Test, also referred as GMAT has witnessed a significantly increasing number of candidates appearing for the exam. While many candidates appear for the first time, it is natural for them to get confused. The Graduate Management Admission Council has not set any GMAT qualification criteria. Thus, an applicant is not required to satisfy a specific GMAT qualification criteria to apply for GMAT. In any case, since GMAT score is used in the admission process of Masters or Post Graduate courses, test takers are ideally required to have an undergraduate degree to cross further levels of the selection process set up by the school they plan to apply to. GMAT qualification criteria is unstipulated. The criteria for qualification for confirmation is set by individual business colleges which additionally incorporates GMAT score. Before applying for the GMAT test, it is fundamental for the candidate to determine his qualification. In the event that a candidate neglects to meet the eligibility for GMAT Online test, his application might be rejected. Here is a complete knowledge of the eligibility criteria for GMAT exam registration, such that aspirants register hassle free. 1.Age limit: There is no bar or restriction based on age and gender. The ideal age for appearing this is said to be 18 years. In case, the aspirant who is between the age group of 13 to 17 years requires a written approval from the parent or any legal guardian that shall be attached according to the format prescribed by the GMAC. There is no maximum age limit set for appearing the test. 2. Nationality: It is often confused that the eligibility criteria may vary across countries. This is not true! The rules and eligibility criteria remain same for all candidates irrespective of the nationality to which they may belong. While candidates from different nationalities are allowed to sit for the exam, it is important to carry documents to the testing centers. 3. Educational qualification: It is important that a candidate must have an undergraduate degree in any discipline from a recognized board or university. Other than this, there is no basic requirement for previous academic qualification for the same and also, there is no upper limit of educational qualification acquired by the candidate. 4. Fluency in English: Since GMAT is designed only and only in the English language, the GMAC assumes that candidates have basic fluency in the language. The questions are framed in English language and have to comprehend accordingly. 5. Differently abled candidates: The candidates with disability status have to attach medical documents at the time of registration. These documents are kept confidential as described in the Privacy Statement. The service providers help to provide accommodations for such candidates. 6. The number of attempts: Candidates may choose to take GMAT exam more than once to as many times as they want. However, the frequency of taking these test maybe once in 16 days. It should not exceed more than five times a year. 7. Test scores: Total GMAT scores ranges from 200 to 800. While scoring a brilliant 800 is good, two third of applicants score between 400 to 600. The score reports that are sent to schools were the candidate has applied admission for will include all those scores that the candidate has accepted. This is inclusive of candidate’s previous scores also, but any GMAT score cancelled by the candidate will not be included. Various business schools use GMAT scores to select their candidates for courses they offer. Cutoff scores and eligibility criteria may differ for each business school in terms of work experience the candidates have and previous academic degree. When should the candidate apply for registration for the GMAT? More than 2, 47, 000 students apply for GMAT across the globe every year. If a student aspires to apply for the exam, the aspirant should plan it in advance. It is better to register anywhere from six months to 24 hours before the test date. This is possible only if the applicant is signing up online. However, registering by mail requires the scheduling form to arrive at least 10 days before the test date. Spots fill up fast, and thus it is better to register as early as possible. It is suggested to register at least two to three months before the test date. This is beneficial to find available test centers and also preparing well for the exam. What is required to register for the GMAT? Telephone and contact details, including the email id. Opt-in information that may be in the form of surveys and other services. The candidate must make sure to have all these information in hand before beginning the registration. This is important because the candidate will have only 20 minutes to complete the registration process. Post registration, a candidate shall have GMAT account that can be used for future reference. There are 3 ways of registering or signing up; online, mobiles, and mail. While vast majority prefer to register online, GMAC also prefers this method. The reason is that GMAC charges a fee of $10 as a service charge for every phone registration. Also, if the candidate chooses to register by mail, the registration request must arrive at least 10 days before the selected test date. This gives GMAC time to process the registration request. 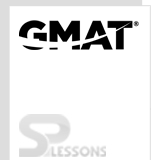 It is important to note here that once the form is filled, it is recommended to write down password of the GMAT account so created for future use. Also, this is required to check the official score report 20 days after the test is taken through the GMAT account.